Our General Campsite is perched alongside the lakes across from the action. There are 2 entrances from the General Campsite into the festival arena. Depending on where you're camped it is a 5-15 minute walk to the arena. There are no designated pitches, just pick a spot and set up camp. While we do not have a restriction on tent size, to make sure everyone has enough space we do not allow gazebos or trailer tents. You can call Frontgate / Ticketmaster on 03330 035 937 . The ideal campsite for families, recommended for those with little ones. Benefits include baby changing facilities, a family welfare point and closest proximity to the Family Field in the Main Arena. Depending on where you are camped it is a 5-10 minute walk to the arena. While we do not have a restriction on tent size, to make sure everyone has a fair amount of space we do not all trailer tents or gazebos. Remember you can only add under 18 tickets once you've begun the adult ticket booking process. For those of you who want a little extra shut eye. We ask that you do not bring portable sound systems or children under the age of 8. Furthest from the Main Arena so if you fancy a late-night party we may ask you to head back that way after 10pm (the unofficial curfew). Depending on where you are camped it is a 10–20 minute walk to the arena. If you don’t have both you won’t be able to access the campsite so, please book both early to avoid disappointment. Please Note: You cannot bring your own tent and stay in Boutique Camping. Don’t fancy the faff of bringing and pitching your own tent? Our Meadow Campsite offers pre-pitched Meadow Tents and Huts, so all you need to do is arrive ready to enjoy the festival, but you can only stay in this campsite if you book one of these on top of your Meadow Festival Ticket. You can sleep between 2-5 people depending on accommodation chosen. Additional perks are a 24-hour reception and proper loos & showers just for Meadow Campers. A Meadow Camping Festival Ticket (1 per person). Meadow Camping Accommodation (Tents from £399 & Huts from £549). You cannot bring your own tent and stay in Meadow Camping. You will need to bring your own bedding. Meadow Tents come empty so you must bring all your own bedding. 4metre: Fits 2 with airbeds comfortably. 3 with roll mats max. 5metre: Fits 4 with airbeds comfortably. 5 with roll mats max. Meadow Huts go one step further than Meadow Tents with beds and mattresses included. Just make sure you bring your sleeping bag & pillow. You or your friend already booked Meadow Accommodation? Book Meadow Camping Festival Tickets ONLY. Our only campsite that can accommodate live-in vehicles, caravans, campervans and tents. A Live-In Vehicle Camping Ticket gives you access to the full festival weekend. A Live-In Vehicle Pass allows you to bring your Live-In Vehicle into the Live-In Vehicle Campsite. Without it, while you could still access the festival you would not be allowed to stay in this, or any other, campsite or the car parks with your vehicle. When Can I Buy My Live-In Vehicle Pass? Passes can be added on during the booking process, at an additional cost of £200. They tend to sell out, so please book them at the same time as your festival ticket to avoid disappointment. You will not be able to stay in this campsite if Live-In Vehicle Passes sell out and you have only purchased a Live-In Vehicle Camping ticket. If you do not buy your pass at the time of booking you can buy them separately here or by payment plan here. If you’ve booked a Live-In Vehicle Pass you must complete our Live-in Vehicle Campsite Registration Form before arrival. What If My Vehicle Does Not Fit Within These Dimensions? You’ll need to buy an additional pass. Can I Have My Live-In Vehicle Delivered To Site By Someone Else? Vehicle must have it’s valid Live-In Vehicle Pass (es) - depending on size (1 per 6x7m pitch) - displayed before it arrives. Vehicles cannot be dropped off before campsites open at noon Thursday 1st August.Vehicles will be directed to a pitch as they arrive, so if you would like to stay next to someone else, it is best to arrive together. What If I Know Someone with a Live-In Vehicle Pass but Want to Stay with Them? Live-In Vehicle Passes are per pitch so the cost can be split among those staying within it. Everyone must be sleeping within the pitch and have their own Live-In Vehicle Camping ticket. Caravans and Campervans are allowed in this campsite. Soft structures, including tents, trailer tents and awnings, are allowed in this campsite provided they fit within your 6x7m pitch – if you need extra space you will need to book an additional Live-In Vehicle Pass. A free Car Park Pass will be provided on arrival to move towing vehicles to Red Car Park. There are no electricity or water hook-ups available. Gas cylinders must be under 7kg. No more than 1 per vehicle. Only fully converted / suitable live-in vehicles are permitted. If you have any doubt please send a picture to info@wildernessfestival.com and we can confirm if it’s allowed. Please read our full Live-In Vehicle T’s & C’s, before booking. If you are an access customer with a live-in vehicle please contact accessibility@mamaco.com. There will be a designated area within the Accessibility Campsite for you and your live-in vehicle. Please note: there are no water or electricity hook-ups available for live-in vehicles in the Accessibility Campsite. There will be a water point for general use. Wilderness Festival welcomes deaf and disabled guests and is working harder than ever to make the show as accessible as possible for everyone. This campsite is exclusively for deaf and disabled guests. It is the closest to the arena with a dedicated blue-badge parking area which is free of charge. Approximately 50m from the Accessibility check-in point over a green-field site. Benefiting from a hard road entrance making wheelchair access easier. We also operate a 2 for 1 (free PA/carer ticket) policy for eligible guests. Only available for Teen and Adult Tickets. More information on this including how to book and accepted proof of eligibility documents can be found here. An Accessibility Campsite Wristband (or one for an alternate campsite if chosen). A complimentary carer/personal assistant ticket if eligible (this is only available for Teen and Adult tickets). An Accessible Parking space if required. Viewing platform at Main Stage (unsheltered). Wheelchair-accessible loos at viewing platform and medic tent (other wheelchair-accessible loos are located in each of the main toilet blocks throughout the arena). Use of the Accessible Drop-off/Pick-up point. Guide/hearing dog resting area located at the Welfare tent. Lowered bars, which will also have large-print menus. Induction loop at check-in point. Partnered local taxi service off site, for those requiring wheelchair-accessible vehicles. Wilderness is on a large green-field site with very few hard-standing paths. While there are some sheltered areas it is mainly an open-air event. Weather and ground conditions may be variable and in times of extreme weather, mobility may become very difficult. We ask you to consider this before booking. The route from the registered blue-badge parking area/pick-up/drop-off point to the Main Arena is approximately 500m over a gravel pathway and green-field site. The Accessibility campsite is approximately 150m from the Accessible parking/pick-up/drop-off point over a green-field site. Please note that strobe effects may be used at the event. There will be no specific announcements prior to the use of strobes and lasers. We are proud to work with Festival Spirit, a life-changing charity that provide the full festival experience to those who would not normally be able to enjoy it due to life-limiting illness or disability. They will have a marquee in Accessible Camping where they will be stationed for throughout the festival with their guests. If this is a charity that interests you, please do visit them for information. While they will be happy to help you with any accessibility questions, we do ask that you contact our Info Tent/Security first with any general questions or concerns. Camping isn't for everyone and that’s OK. You are more than welcome to stay outside of the festival. Just book a General Camping Festival Ticket and use your wristband to come and go as you please within our gate opening times, available later in the year. Driving? Your car park pass will work for the whole weekend, however we cannot guarantee you will have the same parking space each day. 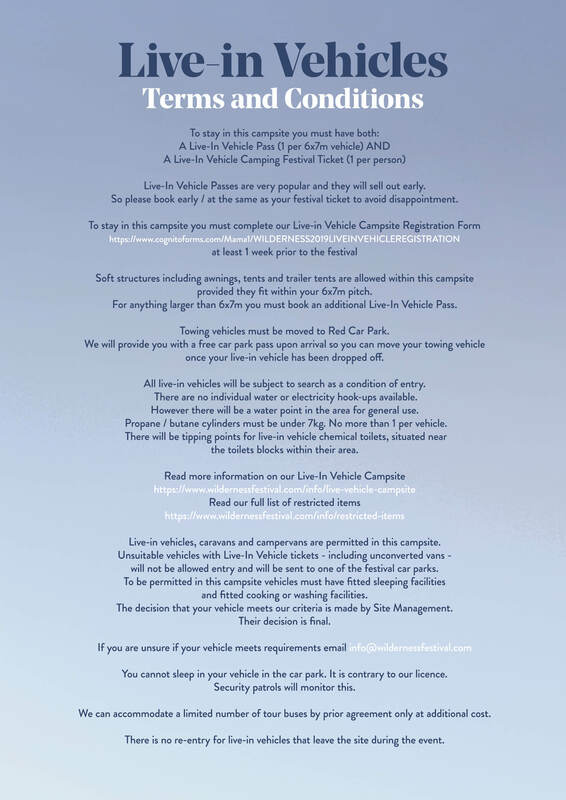 If you plan on driving to Wilderness you will require a Car Parking Pass (1 per vehicle) Book this in advance or buy on site for cash only when you arrive. While we strive to maintain a carefree ethos here at Wilderness there are a few rules we need to put in place to make sure you're all as safe and happy as possible. Live-in Vehicle Campsite: Propane or Butane cylinders under 7kg. No more than 1 cylinder per vehicle. Solid fuel stoves, Greenheat Base Camp Cooker. We ask that people perform a visual inspection of equipment, including seals and hoses to check for wear or cracks before connecting to any gas supplies. Once connected, perform the ‘soapy water test’ by connecting the cylinder to the cooking equipment, use a sponge to apply soapy water to the assembly including any joints. Once covered, turn on the gas (without lighting the stove). Any leaks will be shown by small bubbles appearing in the soapy water or a smell of gas before lighting the stove. The festival has a professional on-site fire team who are on duty 24 hours a day to respond to any fires. In the event of fire immediately evacuate the area and alert a steward, security or member of the Campsite Management team. Gas canisters over 450g or 2.75kg if it’s a rechargeable cannister. No more than 2 disposables and 1 rechargeable cannister are allowed. Excessive amounts of food, cigarettes and alcohol. 12 cans beer / lager / cider / pre-mixed drinks OR 2 bottles of wine (decanted into plastic bottles) per person OR a combination of the two i.e. 6 cans and 1 bottle. Strictly no spirits or hard liquor. You may only bring these in on first entry only. Searches will be undertaken upon entry. If you leave the site, you may be searched again upon re-admittance. ­Any alcohol above this allocation will be confiscated. This alcohol may only be consumed in the campsite. As much as we'd love you to stay, unfortunately at some point we have to ask you all to return home. We ask that you vacate campsites by noon. Please note gate times are subject to change - especially in the evening depending on how busy it is. You are welcome to leave the festival at any time but re-entry is only permitted during gate opening hours. Greenheat Base Camp Cooker / Solid fuel stoves / Any stoves must be raised off the ground. Live-in Vehicle Campsite: Propane or Butane cylinders under 7kg . No more than 1 cylinder per vehicle. Each campsite has loos, showers and water points. There will also be plenty of loos and water points in the Main Arena. In order to help us become more sustainable and environmentally minded we ask that you bring a re-usable water bottle to use throughout the weekend and avoid wasting water by leaving taps running. We will be partnering with Loowatt again this year to provide our eco loos in the Main Arena and one or two of the campsites. Check back for more information later in the year. Wilderness operates a ‘leave no trace’ policy. We kindly ask you respect our stunning parkland by making sure you put rubbish in the bins provided. Bins are split into 3 to aid with recycling and proper disposal of rubbish - please take the time to split rubbish out accordingly. Each Campsite has roaming security and security watch towers, if you are unsure about anything please contact them or find your nearest campsite manager. Please consider the following suggested security precautions. Clearly mark property with your address, postcode or contact number. This helps deter thieves and ensure lost goods get returned. Use on-site lockers rather than belongings in your tent. These will be available to pre-book soon. Sleep with valuables in your sleeping bag and not near the door of your tent. Don’t carry big amounts of cash on you, there are cash machines on-site. Bars and venues accept card payments. Don’t carry all of your cash or valuables in one bag or pocket. Only take the items in your wallet that you really need. Leave any unnecessary cards and keys at home. Safety in numbers, set up camp with friends and create a community with your new neighbours. Be untidy in your tent – don’t leave everything in one bag that can be grabbed quickly. Do not challenge anyone you find looking through your tent. Take a mental image of what they look like and report them to festival security or the police. Don’t leave anything valuable in your car. Empty all belongings from our glove compartment and leave it open. Rub off any marks left by sat nav’s on your windscreen. If you witness a crime or are unfortunate enough to become a victim of crime it is important that you report it immediately so we can act on it as soon as possible – you can do this by finding your nearest security guard. It’s much easier for us if we have as much information as possible. If you can remember appearance, clothing etc. of the person and the exact details of where you were at the time the likelihood of us finding them is far greater. We work incredibly hard to ensure any lost property is returned to it's rightful owner throughout and post festival. If you lose an item please fill out our Lost Property Form and pop by the Info Tent to see if it's been handed in. If you find an item please hand it in at the Info Tent on-site. If a member of the stewarding or security team have bothered you in anyway the you can let us know directly on-site at the Info Tent. It is important that you get their name/I.D. number otherwise it becomes quite tricky to pin down exactly who it was. We take staff misconduct very seriously so please let us know. Give your children the same advice you would if you were anywhere else; don’t go off with strangers or anyone without telling you first. If they get lost have them ask for help from a member of security or a steward. Any found children will be cared for in the Welfare Tent and this would be the first place to head if you have been separated. It's really helpful if you give your child a copy of your phone number. If you find a lost child please take them to a security guard, the Info Tent or Welfare Tent.